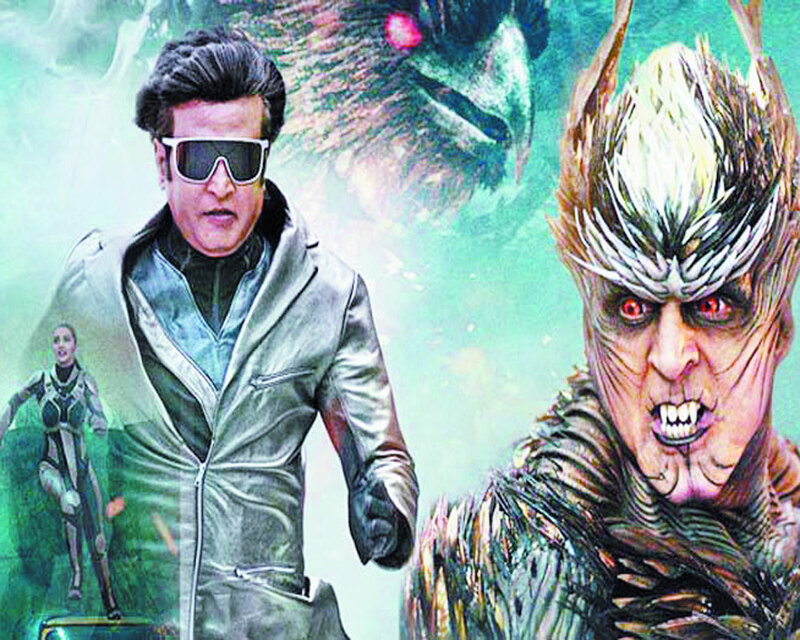 Rajnikanth superrrstar fans, here’s the big He in three sizes for you — small, medium and large — all in extra large gizmotic reality. There is Akshay Kumar too in a feathered winged camouflage. And yet there is not enough of either as technology takes over with a lot of talk and explanations around it. Maybe despite the robot Chitti having booted in eight years ago Rajni fans continue to be dumb enough to need a lengthy explanation to every nut screw and bolt used to prop up 2.0, the scientific fiction around a rebooted humanoid robot and his job of saving the world from evil. The evil facing Chitti this time round is a bad spirit obsessing about a good cause. Cell phone tower radiation and overuse of the mobile technology comes with its radiation hazards which this bad spirit played to the hilt by Akshay as Pakshiraj, killing people as a deranged falcon spewing fire and hatred on humans anywhere near cellphones. He kills Armymem with the same impunity as he does greedy telecom corporates which takes you quite some paces away from his genuine jung against the culture of invasive cell phones. Even though you can’t fault the gizmos and the special effects have been used in the film to perfection, there is still this thing about over usage of technology, which in the context of the film means as gobbling IP the storyline or whatever little there is of it. Come to think of it, the movie is much more about loosing footage to cell phones, rogue and possessed ones at that, than there is Rajni in the shots! Inexcusable when it comes to all you Rajni fans! Despite the redone Chitti, the Amy Adams as bot secretary and the nano bots that try to perk up proceedings, one has to pull at dregs to keep the interest high. That’s despite Rajni who incidentally comes across as a pithy man in 3D and not larger than life as his real reputation is. And by the way the nano bots Rajni speak and giggle very strangely like none other than Shah Rukh Khan who is showcased as a dwarf in the upcoming film Zero which launched its trailer with this film!